NOTE: This item already includes a Floor Sensing Thermostat Part #AC112-01 in the box. The best quality thermostat that handles up to 3600W for 240V and 15A of resistance and made specially for under floor heating systems. + Honeywell Radiant Floor Sensor is included. Its illegal to install NON CLASS A thermostat in Bathrooms & kitchens, You are assuming the liability. AUBE Model TH115-AF-GA built-in GFCI Programmable Thermostat for radiant floor heating with 5mA. 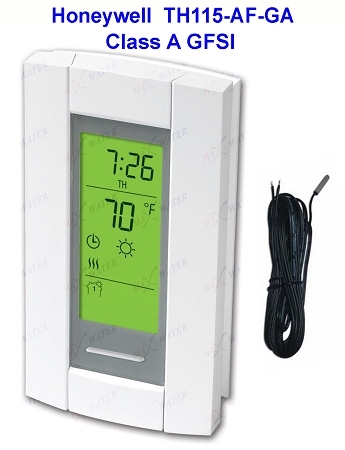 WarmSurfaces uses Class A thermostat Only ( Ground Fault Circuit Interrupter) , this thermostat is also an electronic on/off thermostat for control of temperature by means of a sensor either placed externally or build into the thermostat. It has a build in clock function for automatic comfort and setback. WarmSurfaces Generates 12 watts of comfort per square foot of flooring (120 w/square foot). The thermostat will preset your personalized comfort. While saving electricity and money. 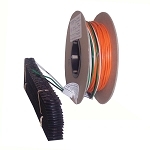 WarmSurfaces comes as a heating cable. a heating mat, or a combination of both. It heats safely, with less that the minimum acceptable emissions of EMF (electromagnetic field). This Aube dual voltage programmable thermostat can be used with 120-volt and 240-volt floor heating systems. Includes an in-floor sensor and a digital display that indicates the exact floor temperature. It also features a manual setback to a "high" and a "low" temperature level, and it features a built-in electric GFCI. 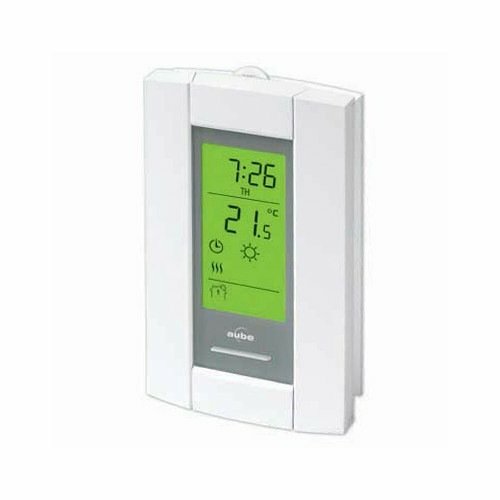 Advanced temperature control ensures total comfort by minimizing temperature variations ON/OFF switch enables thermostat shutdown at the end of heating season for added security. Early Start function ensures programmed temperature is reached by programmed time. Temporary bypass enables temperature override without changing programming. The programmable function allows you up to 4 setting changes for each day of the week. For installations utilizing more than 240 square feet of electric radiant floor heating product, a Master Thermostat with Power Module or a Relay Contactor is also required.